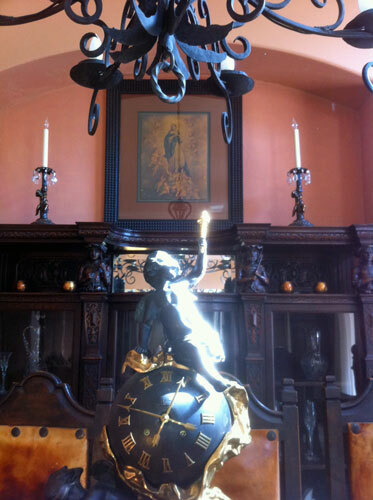 Find EuroLux Antiques on YouTube! 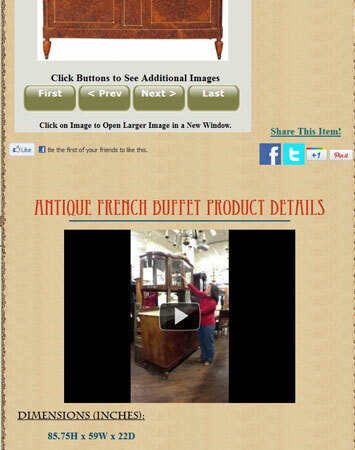 Here is our very first video blog at EuroLux Antiques! We plan to bring you short videos about all sorts of interesting antique and vintage-related topics. This one is about how easy it is to hang (and take off) doors on Antique French furniture, like this beautiful Antique Renaissance Buffet. In the upcoming months, we will be filming product videos for all of our antique and vintage pieces, so that we can give you the highlights about each piece in just a few minutes. 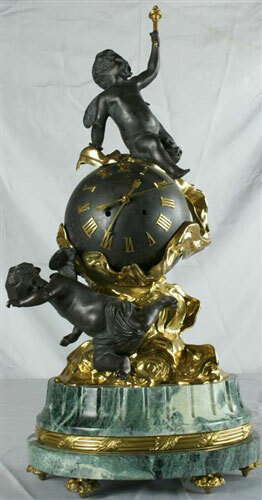 You’ll find these videos on the product listing pages of EuroLuxAntiques.com, right under the main image. In order to film these videos, Greg and I have set up a really great portable video solution, thanks to the recommendation of my old friend (from elementary school – thanks Facebook! ), Ryan Steinolfson at Accelerate Marketing. If you are interested in setting up your own portable video solution, I definitely recommend checking out his very informative Portable Video blog. Not only does he know a tremendous amount about internet marketing, but he kite surfs too – is that cool or what?! If you have antique or vintage-related questions or topics that you would like to hear about on the EuroLux Antiques blog – let us know! This entry was posted in News and tagged EuroLux Antiques YouTube Channel, How to Hang Doors on Antique Furniture, Portable Video Solution on February 29, 2012 by euroluxantiques. 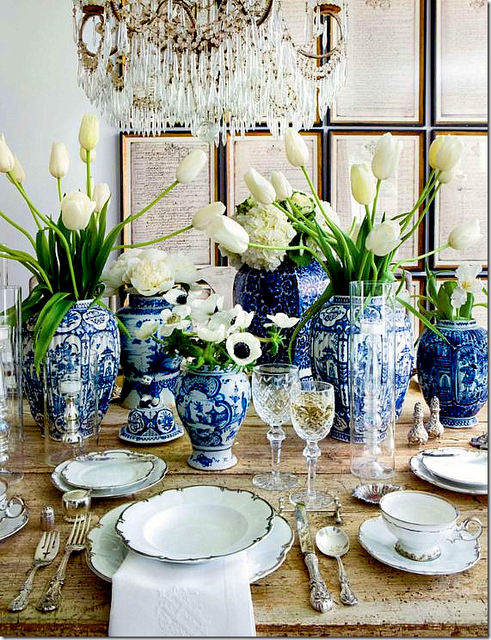 Blue & White Delftware is Still a Delight! 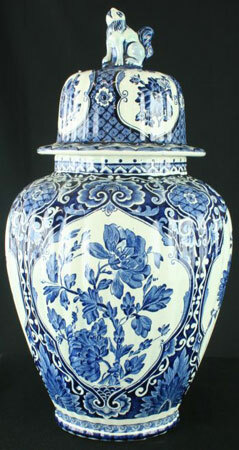 Do you love how a large collection of blue and white pottery looks so pretty grouped together? Me too. 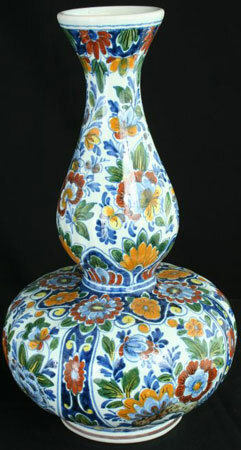 I am just crazy for hand-painted Majolica ceramics, and I especially love Delftware, which is why we carry a large selection of Vintage and Antique Delftware at EuroLuxAntiques.com. 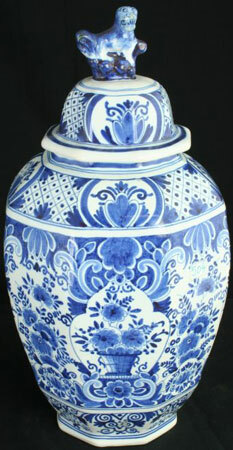 From Antique Blue Delft Tiles, to Vintage Blue Delft Transferware Plates, to truly unique Antique Hand-Painted Polychrome Ginger Jars like the pair below, you’ll find it all at EuroLux Antiques. 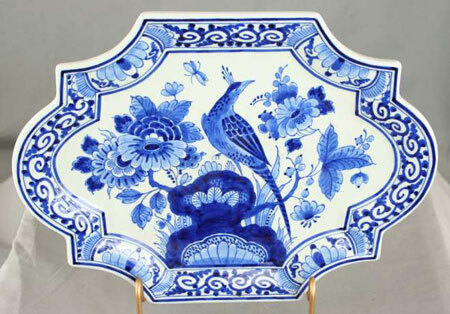 In case you aren’t aware of how Delftware came to be, it all started with the European craze for blue and white Chinese export porcelain back in the early 17th century. 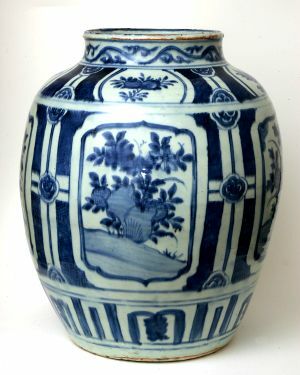 Wealthy Europeans just couldn’t get enough of these striking pieces, so that when there was an interruption in the supply of goods from China due the fall of the Ming Dynasty, enterprising Dutch potters from a small town in Holland called Delft, stepped in to meet the market demand. 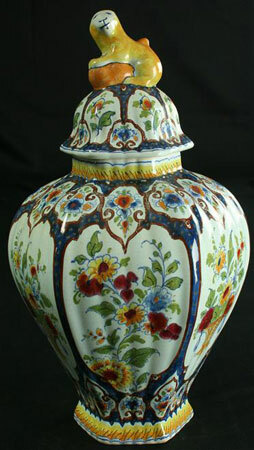 The Delft potters imitated the look of Chinese export porcelain by using the tin-glaze techniques used by the Italians to create Majolica, also called Faience. 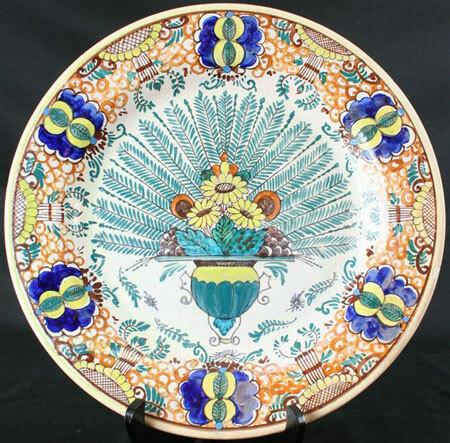 Below is an example of a Vintage Hand-Painted Italian Majolica Charger. Delftware was a huge success and by the 18th century, there were more than 30 companies creating high-quality pieces in Delft, Holland. At first Dutch potters drew on Chinese designs for inspiration, like this Antique Hand-Painted Blue Delft Vase and the Antique Hand-Painted Polychrome Delft Charger below. 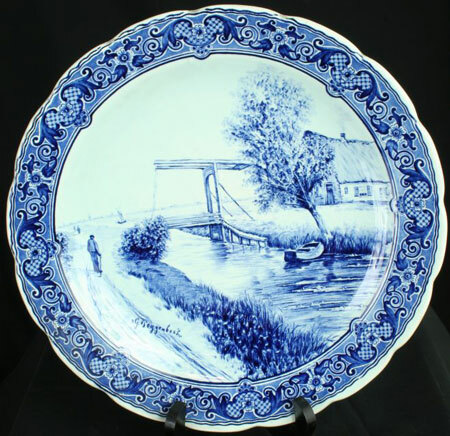 However, Dutch potters soon began to incorporate elements from European culture and decorative plates were made in great numbers featuring windmills, canal scenes with fishing boats, landscapes, seascapes, and scenes of people in daily life, like these Vintage Blue Delft Transferware Plates dating the the 1950s below. 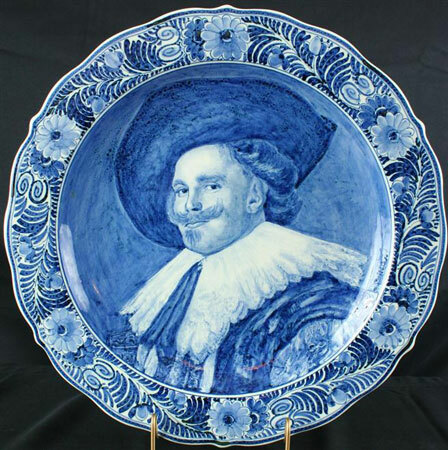 Even famous works of art were copied on Delftware plates, like this Vintage Hand-Painted Blue Delft Charger featuring the famous Dutch Golden Age painter, Frans Hals’ The Laughing Cavalier. When the flow of Chinese export porcelain resumed under the Qing Dynasty in 1685, the Chinese brought colored wares, such as pinks and greens. Not to be outdone, the Dutch potters created Polychrome Delftware, using all the colors of the rainbow, including yellow, orange, green, purple, dark red, brown, and black, and created different shapes too, like the Antique Hand-Painted Polychrome Ginger Jar to the left below and the Vintage Hand-Painted Polychrome Knobbelvase to the right below. 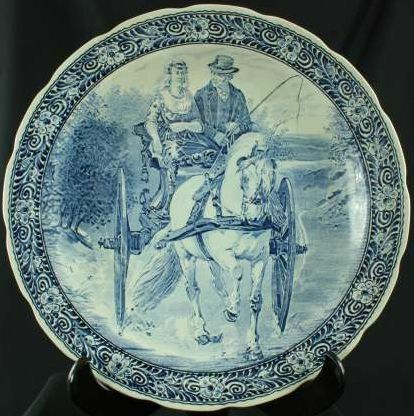 Despite the huge success of Delftware, tastes change as generations pass and by the end of the 18th century, the market for Delftware had eroded to the point that only one of the original Delft manufacturers remained in business: De Porcelyne Fles. The factory was purchased by an enterprising man named Joost Thooft in 1876, which marks the advent of what is considered Modern Delftware. Since that time, De Porcelyne Fles (often called Royal Delft and marked with a bottle as shown here) has become the most famous producer of the more than one hundred manufacturers of Modern Delftware, which is still created in England, Belgium, Germany, Japan, and the USA. 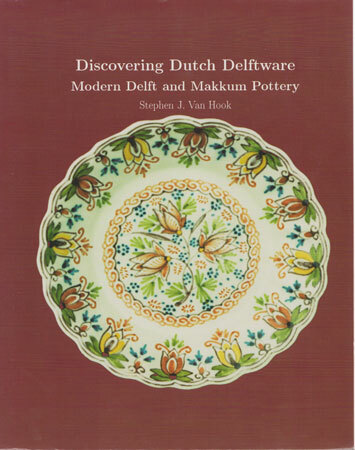 An excellent book that should be on the shelf of any Delftware collector is Discovering Dutch Delftware: Modern Delft and Makkum Pottery by Stephen J. Van Hook, which includes photographs of the marks for a large majority of Modern Delftware companies. 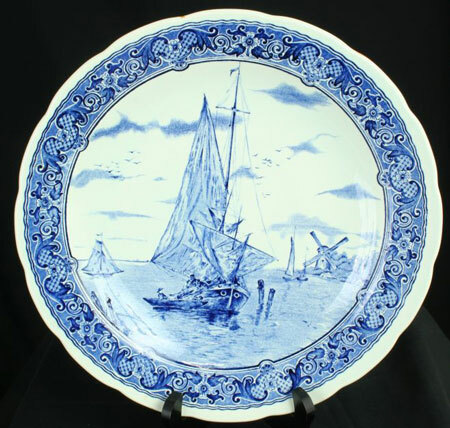 I was delighted to find a recent Wall Street Journal article called “Delight in Blue and White”, that states “old or new, Dutch Delftware can be an excellent value – and fun to hunt down,” and mentions that the popularity of Delftware is on the rise once again. If you’re seeking to expand your collection, you can find Antique Hand-Painted Blue Delft Gingers Jars like the one on the left below, or Vintage Transferware Blue Delft Ginger Jars like the one on the right below at EuroLuxAntiques.com! I thought I would also link you to the wonderful blogpost, 56 Reasons Why I Love Blue and White Jars by Tina at The Enchanted Home, which shows 56 different photos of how to incorporate blue and white Delftware into your home design! This entry was posted in Home Design Ideas, Learn History & Styles and tagged Antique Blue Delft, Antique Delftware, Blue & White Design, History of Delftware, Modern Delftware, Vintage Blue Delft, Vintage Delftware on February 14, 2012 by euroluxantiques. Greg and I delivered a beautiful Renaissance Buffet in Bridgeton, New Jersey while we were up north vising family during the Christmas holidays. 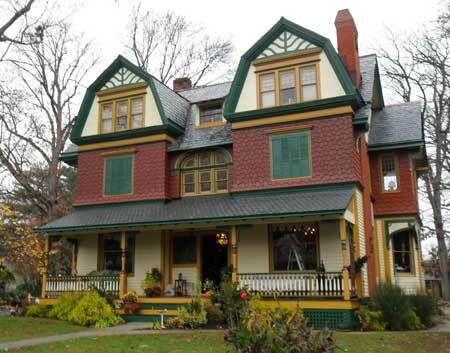 When we pulled up in front of George F.’s Victorian home, we were amazed to see the fantastic restoration and colorful paint job. George mentioned that he has been restoring this Victorian home, which dates to 1890, for several years and says he is almost finished. 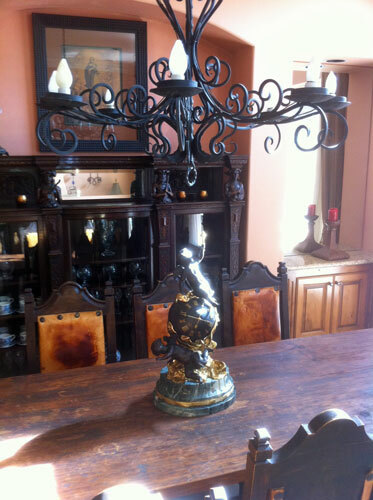 Two thumbs up from EuroLux Antiques for a job well done! George purchased an elegant Antique French Renaissance Henry II Style Buffet dating to 1920 in oak with a rich patina and pretty carved flowers. 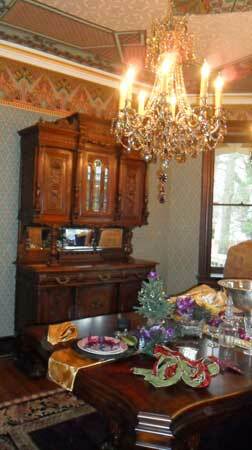 George placed the Antique Renaissance Buffet in the dining room, which was just beginning to be decorated for the holidays when we arrived. 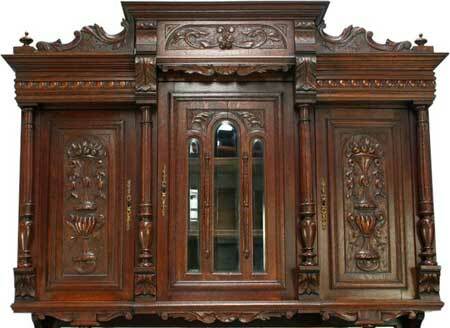 The Antique Buffet perfectly matched an amazing stained glass window in the dining room that is original to the home. I was quite impressed with the reproduction patterned wallpaper on the walls and ceiling, which gave a very good impression of how the home may have been decorated at the turn of the century. 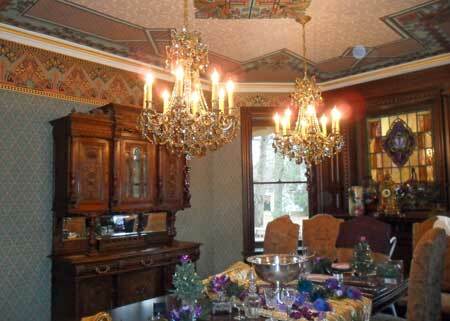 Of course, the crystal chandelier was a wonderful finishing touch in this beautiful dining room. As we were leaving, George and a few helpers were busy decorating for the holidays as his home would soon be featured on the upcoming 2011 Historic Bridgeton Christmas Open House Tour in Cumberland County, New Jersey. 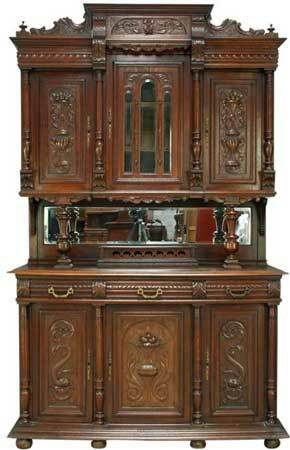 If you are searching for a unique buffet or sideboard to add to your dining room, or any space in your house that could use a piece of high-quality antique furniture, look no further than EuroLuxAntiques.com. This entry was posted in Client Spotlight and tagged antique buffet, antique french buffet, Antique French Renaissance Henry II Style Buffet, EuroLux Antiques, new jersey on February 1, 2012 by euroluxantiques.